There was a huge amount covered but we wanted to share with you some of the key learnings we took from the day. One of the key themes of discussion was how to provide frictionless experiences for online customers. You need to make sure that every step you ask the customer to take is essential. If you add steps you create friction for your customer, and make it more likely they will leave your website – without spending any money. Remember, there is no one-size-fits-all answer, so focus on what is right for your customers. Analytics is a free-to-use tool provided by Google that gives you the data you need to make informed decisions about your website and online sales. You can see at what stage in the process potential customers abandon their shopping carts, what pages they engage with and where they interact with your website. Simply put, if you want to sell online, you need to use and understand Google Analytics. Customer experience is just as important online as it is in the real world. When you’re selling online the best advice is to be authentic and true to yourself when creating an experience for your customers. Is there anything on your website that you would never dream of saying when face-to-face with a customer? Is there anything unique that’s overly wordy or trying too hard? If so, get rid of it. Make your online business special – by allowing it to be the online representation of the things that your customers value the most. Social media sites are a great way of amplifying your message and building an audience for your business. However, as an SME grows, remember that you do not control how these sites are managed. Changes in a social media platform’s procedures, algorithms or processes can instantly cause the ground to shift under your feet. If your online presence is only on social media platforms this could be devastating for sales growth. In order to have full control over your online selling process you need to build a website. You can then direct all traffic from your social media accounts to purchase on the site, in a manner that you have complete control over. The image above was used to highlight how the traditional video rental shop model was completely destroyed by online disruptors. 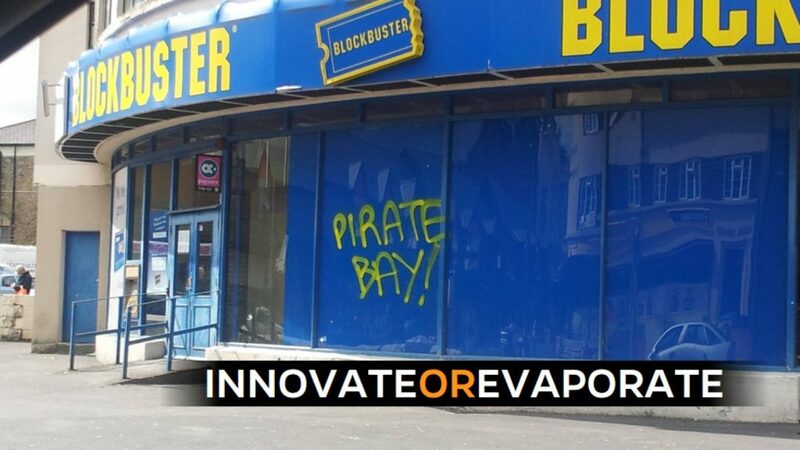 Firstly, Pirate Bay eroded the market for Blockbuster. Glossing over the legal and moral issues surrounding this, it effectively meant that people could now get movies online, without leaving the house. With Netflix and similar services improving, and legalising video and movies on demand, it meant that the traditional video shop was no longer viable. If the video stores had innovated their business model they might have stood a chance. It pays to monitor your competition closely and tweak your offering accordingly. Ok so this is an obvious one. However, ‘knowing your customer’ is often forgotten about online where identifying and knowing your customers can result in a distinct competitive advantage. One third of Amazon’s sales come directly from the personally tailored recommendations that they send to their customers. Offering your customers relevant products based on their purchase and browsing history can, and does, lead to repeat business, but being able to put your finger on exactly what your customers want can also help to tailor and kick-start your marketing activity as well. Nobody knows your customers better than you do – reflect this in your online offering and cater to them as much as you can. This ‘offliner conundrum’ was covered in our most recent dot ie Digital Health Index and remains an important issue affecting Irish businesses. In fact, only a minority of Irish SME’s who do have a website can actually take sales orders online (29%) and even fewer can process payments online (25%). The key messages at Ireland’s Internet Day were simple – firstly if you’re in business in 2016 you need to be online, ideally with your own website but at the very least your customers need to be able to find you when they search for you, otherwise they’ll become somebody else’s customers quite quickly. Secondly, if you are online, you should be looking to use your online presence to drive and grow your business. The internet provides you with access to a global market 24/7, 365, it’s up to you to embrace the opportunities this provides your business.